Nathan holds a Master of Social Work degree and is a Registered Social Worker. He is the Managing Director for CTRI and works with organizations and communities through a needs assessment process of identifying the best resources and training to meet their needs. Nathan also provides leadership in developing and managing CTRI trainers and course content. Prior to this role he coordinated service delivery and rehabilitation planning for repeat offenders with a diagnosis. Nathan has refined skills in risk management and collaborative treatment planning for people in conflict with the law. In addition, he possesses specialty in the areas of disability services, case management, and working with people with Fetal Alcohol Spectrum Disorder. 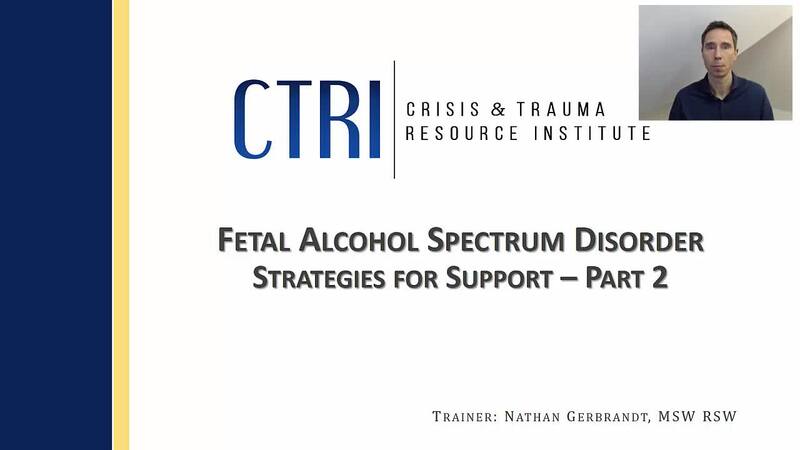 Nathan is the author of CTRI's Fetal Alcohol Spectrum Disorder – Strategies for Supporting workshop. He believes that despite any trauma, mental health, and physical challenges, all people can find great success in their lives. Nathan is an engaging presenter who uses an interactive style to maximize the learning potential of participants. This webinar will provide information on intervention strategies, functional assessment, developing a collaborative care network, and case management. Practical and meaningful ways to support individuals, families, and communities are explored. SKU: 99. Category: CTRI Webinars.